Today I have been traveling, so I am just now getting to the A to Z Poetry Challenge Day 11. What fun! Rena Traxel is doing a great job of giving us a variety of challenges for writing poetry. Today she challenged us to write a poem using an awesome online tool. 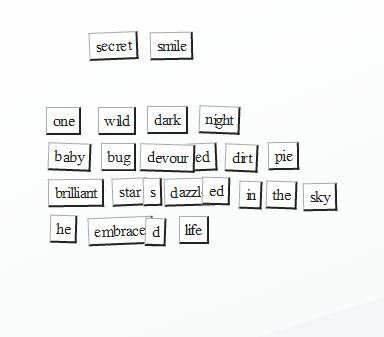 The Poetic Magnetic Poetry Kit is a place where they give you random words to make a poem. You drag the words onto your work area. You click to get additional words, if you need them…but you don’t always get the word you would really like to use. It is addicting. I’m sure there will be a 12 Step Group for it in the near future. I took a screen shot of my poem. You must go try it!!! ← A to Z Poetry Challenge Day 10: Be An Author! That’s wonderful Penny and how clever to do a screen shot! Thanks, Catherine. I thought the screen shot would make it very authentic! Adorable! I will NOT go to that site (right now)…I will NOT!!! I will n…. Ha! You went, didn’t you? Oh you had some fun with this one, I can tell! There’s even a title. You didn’t answer Natalie’s question. How many hours, huh Penny? Anyway, I had fun reading this one. I love this poem. Sweet poem! Love the way the post looks straight from the website… I didn’t know you could do that. Great job Penny! Do you have the snipping tool on your computer? I use it constantly. It will take a picture of anything on your screen…you just drag a rectangle around it. I have a windows computer and haven’t used a Mac in a while…but whichever you have, there’s a way to do it. It’s very handy. Penny, you are funny. I howled at the 12 Step Group! Lovely poem. Makes me think of when I was a kid and tried eating dirt followed by playing in the mud. I was embracing life (my parents weren’t impressed). I love the smell of dirt after a rain…it actually does smell good enough to eat! Now that may be TMI!